Mary is depicted over half-length, standing with her child in her arms, beside an arch with gothic tracery and landscape in the background. 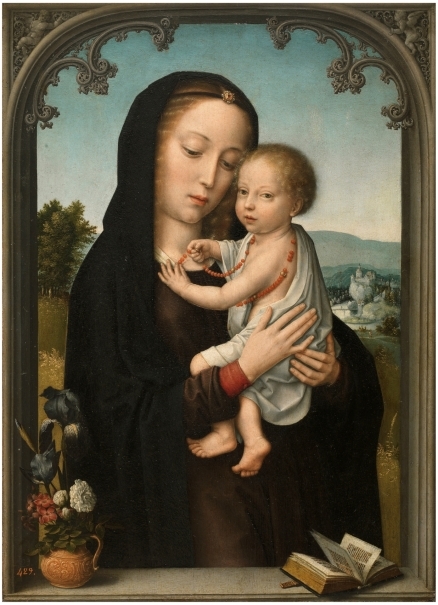 The Christ Child plays with the coral beads of a rosary his mother wears, but he looks out at the viewer, rather than at her. This detail, along with Mary´s pensive expression and the flowers in the vase, alludes to the future passion of Christ, which the painting foreshadows. 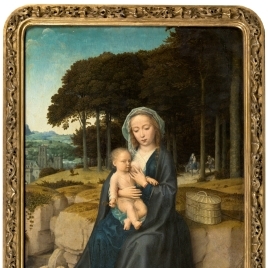 While this work´s characteristics point to the style of Gérard David, some aspects are foreign to him, such as the trompe l´oeil frame with tracery and the lanscape, which is associated with works by Simon Bening. It belonged to Felipe II, who sent it to El Escorial in 1577. Height: 45 cm. ; Width: 34 cm. 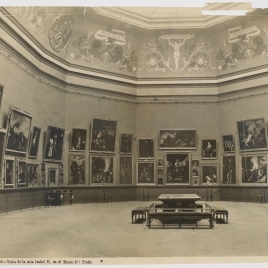 Royal Collection (Real Monasterio de San Lorenzo, El Escorial-Madrid, pieza del oratorio inmediato a la antecámara de la Celda Prioral, 1839).